April 24th Village Board Agenda! 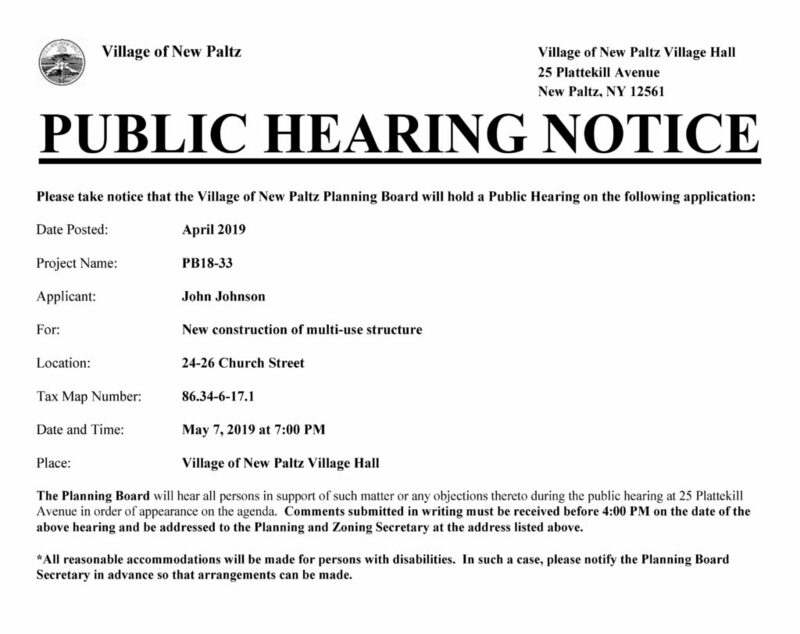 Click here for the April 24th, 2019 Village Board Meeting Agenda! 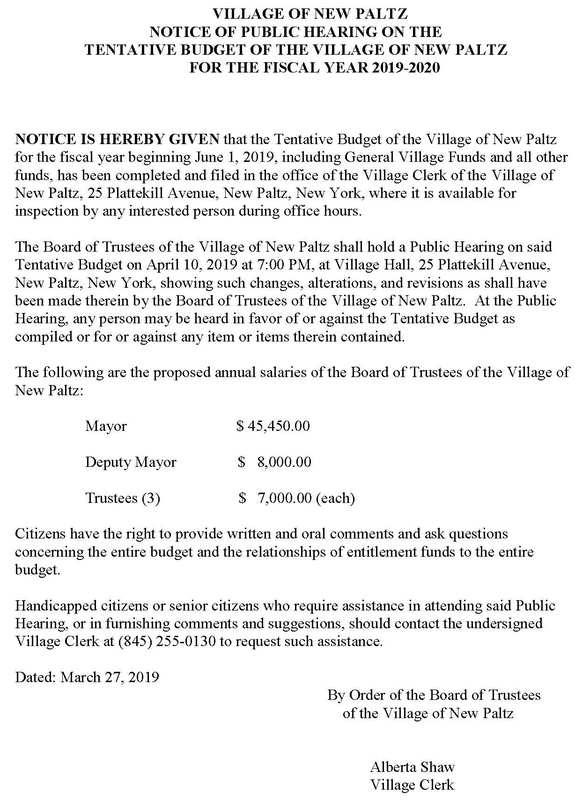 Village of New Paltz Offices will be closed on Friday, April 19th, 2019. Offices will reopen on Monday, April 22nd, 2019 for regular business hours. The confirmed Agenda for the upcoming April 16, 2019 meeting of the Planning Board is now available, here. April 10th Village Board Agenda! Click here for the April 10th Village Board Meeting Agenda! Village of New Paltz Residents, please note: April 26, 2019 is the last day to register with the Ulster County Board of Elections to be eligible to vote in the Village election on May 7, 2019. To contact the Board of Elections call 845-334-5470 or go to www.ulstercountyny.gov/elections/registration. The Planning Board meeting that was scheduled for Tuesday, April 9, 2019 at 7 PM has been CANCELED. The Minutes from the March 5, 2019 Planning Board meeting are now available, here. 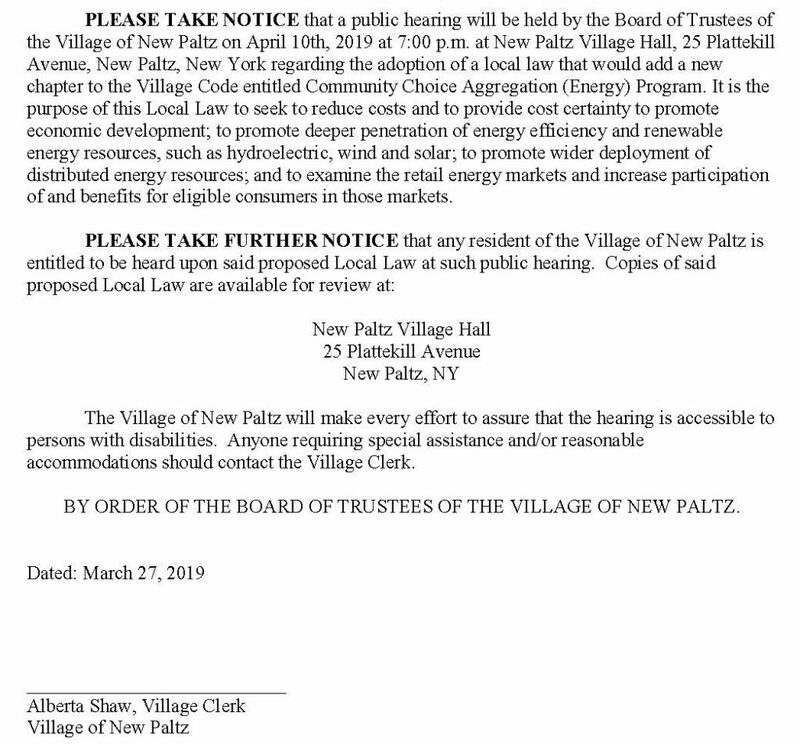 Pursuant to the requirements of the New York State Office of Community Renewal, the Village of New Paltz will conduct a public hearing to obtain the input of citizens, particularly low and moderate income persons, with regard to the Small Cities Community Development Block Grant Program (CDBG). The Village of New Paltz will hold a public hearing on April 10, 2019 at 7:00 PM at the Village Hall, 25 Plattekill Avenue, New Paltz, New York 12561 for the purpose of hearing public comments on the Village of New Paltz’s community development needs, and to discuss the possible submission of one or more Community Development Block Grant (CDBG) applications for the 2019 program year. The CDBG program is administered by the New York State Office of Community Renewal (OCR) and will make available to eligible local governments approximately $40 million for the 2019 program year for housing, economic development, public facilities, public infrastructure, and planning activities, with the principal purpose of benefitting low/moderate income persons. The hearing will provide further information about the CDBG program and will allow for citizen participation in the development of any proposed grant applications and/or to provide technical assistance to develop alternate proposals. Comments on the CDBG program or proposed project(s) will be received at this time. The hearing is being conducted pursuant to Section 570.486, Subpart I of the CFR and in compliance with the requirements of the Housing and Community Development Act of 1974, as amended. At the hearing the Village will describe types of grant assistance available from the NYS Office of Community Renewal and will seek comments and suggestions from the public as to proposed uses of Community Development Block Grant funds. The types of activities that may be undertaken with Community Development Block Grant program funds include acquisition and disposition of real property, public facilities and improvements, clearance activities, public services, payment of non-federal share of another federal program, removal of architectural barriers, relocation, rehabilitation and preservation activities, economic development and job creating activities. A draft application for Community Development Block Grant assistance will be discussed. The Village proposes to submit a 2019 CFA Public Infrastructure application in an amount not to exceed $750,000 to replace aged sanitary sewer facilities to continue complying with a NYS DEC Order on Consent. The proposed project will primarily benefit low and moderate income persons. 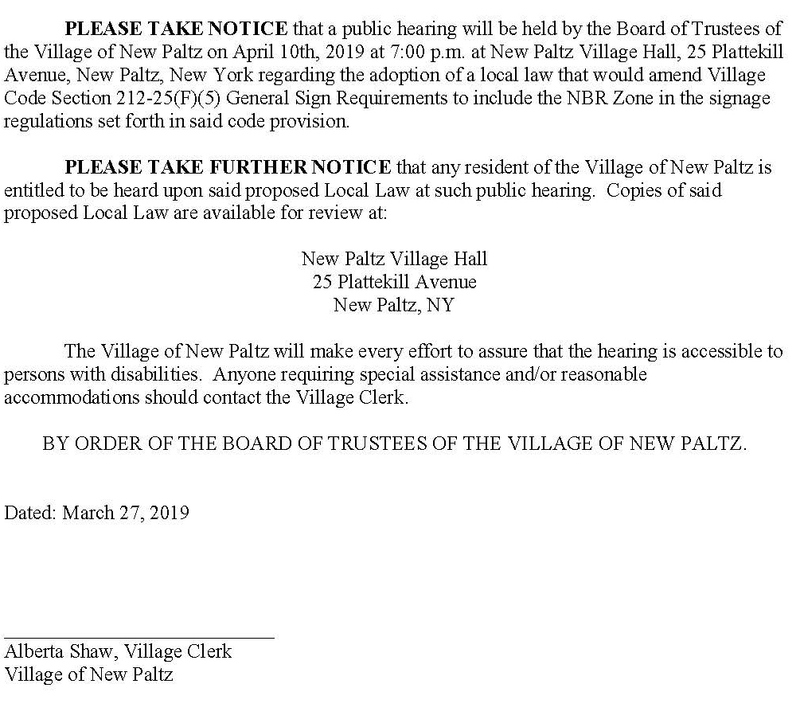 The New Paltz Village Hall is accessible to persons with disabilities. If special accommodations are needed for persons with disabilities, those with hearing impairments, or those in need of translation from English, those individuals should contact Village Mayor Tim Rogers, Village Hall, 25 Plattekill Avenue, New Paltz, New York 12561 845-255-0130 at least one week in advance of the hearing date to allow for necessary arrangements. Written comments may also be submitted Tim Rogers, Village Mayor, Village Hall, 25 Plattekill Avenue, New Paltz, New York 12561 until April 25, 2019. This meeting is being held at SUNY New Paltz Student Union Building Room 419.